With eight percent of children having some sort of food allergy, raising awareness is important. After all, you don’t want to be the one innocently giving a child something that could trigger a life threatening reaction. It seems that food allergies are here to stay. A 2008 by the Centers for Disease Control and Prevention showed an 18% increase in food allergy between 1997 and 2007. Peanut allergy also tripled during that time. Some kids can react to an allergen being in the air or a handprint on a play structure, others need to ingest it. For those who have more tactile allergy triggers, the world can be a dangerous place. I’ve heard of moms leaving playgrounds when they see kids eating peanut butter and jelly sandwiches. Imagine peanut butter getting on one child’s hands and then transferring it or traces of it to the playstructure. Such a result could present a serious danger to some children. A small number of foods are responsible for 80% of all allergies (milk, wheat, soy, eggs, fish and nuts). The most common childhood allergies are to milk, wheat, soy, eggs. These allergies are likely to resolve during childhood. Other allergies, like to nuts and fish are said to be more long term. With food being such a part of our culture, a restricted diet presents challenges especially for young kids who are too young to regulate their own food intake. From birthday parties to playgrounds, the snacks offered can pose serious risks. For kids with egg allergies, innocent foods like French toast, mayonnaise, quiche, custards and meringues, are problematic. Being the mom of a child with food allergies is a nerve wracking anxiety provoking experience. Bobby first showed sign of being allergic with a light rash on his face. As he got older his reaction intensified – vomiting, tongue swelling and trouble breathing. So, as his mom, I’ve learned to watch him like a hawk. You could say I am a helicopter parent on steroids. When a piñata breaks at a birthday party, I have been filled with a sense of dread as I look to make sure I am able to monitor what candy my child eats. Of course he goes for the candy in shiny packages. Explaining why some kids are able to eat peanut butter cups or why the Easter Bunny would leave candy that can’t be consumed has been a bit of a challenge. The good news is that as he get older, he will be better able to understand the result of his allergies and self regulate his intake. Not knowing when a new food allergy will show itself is a challenge and downright scary. Such has been my experience lately, requiring the inaugural use of the Epi Pen and resulting in Bobby’s first (and hopefully last) ride in an ambulance. Holding Bobby as he struggled to breathe was my worst nightmare. For seconds, I contemplated whether to subject him to one of the things he hates most – a shot. As much as I hated him having him the shot, I knew he needed it. I held him, my brave husband gave it. Within seconds, that shot somehow helped him breathe. After being able to breathe, he thought it was so “cool” an ambulance and a fire truck came to his house. I thought it was so “cool” that they arrived so quickly. But – Bobby, yes, this was an impromptu party. For parents of kids with allergies, there are things we can do to. We can educate others about our children’s’ allergies. In fact, I hesitated to write this article as I want so much for Bobby to be treated just the same as the other kids on the playground. The reality is that he can be treated that way, but that the adults caring for him need to know how to use the Epi Pen should the need arise. On that note, Bobby’s school actually invited me in to talk to the teachers. They even practiced using the Epi Pen. Here in Sonoma, two schools are at least partially nut free – Valley of the Moon (entirely nut free) and Sunshine School. Old Adobe Preschool is also attentive to children with allergies. There are little things we can all do to make the world a more allergy friendly place. Before giving a child a snack, ask their parents if it’s ok.
Have kids wash their hands with soap and water or wipes after eating. There is research to suggest that hand sanitizer won’t get rid of trace amounts of food. 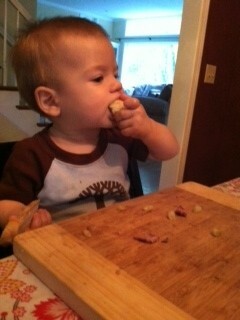 When hosting a party, make sure food is on countertops out of the reach of young kids. When your child is done eating, make sure uneaten remnants make it into a trash can. Be supportive of parents whose kids have food allergies. If you think they are overreacting or being overprotective, then check out a video on youtube of a child having an anaphylactic reaction or just ask me what it’s like. I’m happy to tell you. Remain positive. Stress the strengths of kids with allergies. So where’s the silver lining? Current scientific studies may hold promise for the future. For example, there are studies currently as to introducing trace amounts of foods to develop a tolerance. Also, kids with food allergies learn to be tough. Heck, I’ve heard of an Army Ranger who has a peanut allergy. So with the right support, our kids can have the option of being rangers too. For more information about food allergies – check out FAAN (www.foodallergy.org), the Food Allergy Initiative (www.foodallergyinitiative.org) and the Food Allergy Project (www.foodallergyproject.org). This entry was posted in allergies, eagle mom, food, parenting, sonoma, tips and tagged child safety, children, children allergies, epi pen on August 28, 2012 by Modern Mama. Summer is here and so too is the heat. If you are like me, you are probably wondering where to take your little one to escape the heat of the day. My local town, Sonoma offers many fun and educational options. Your town probably offers similar options. Local libraries are the way to go. Books area always a good idea, and on certain days the library offers special activities for kids, such as story time. In Sonoma, the 10:30 a.m. time slot is designated for toddlers and 11:30 a.m. is for preschoolers. If they’re not into the reading mood, remind them the library rents movies as well. Another idea is to pay a visit to one of the local children stores. Here in Sonoma, the Toy Shop and Pet Store are located in the Marketplace shopping center (201 W. Napa St.), and the Corner Store is on Napa Street near First Street East. Grab a shovel or new toy for your next visit to the park, or stop by the Pet Store to see some house friendly pets. I highly recommend the fish – very low maintenance. Art galleries and museums are another tantalizing treat for young eyes. Sonoma also has many small art galleries or the larger museum. The Sonoma Valley Museum of Art provides another chance to do something educational. Enjoy the air conditioning and coffee while the rugrats get cultured. Tickets are only $5 per adult, and kids are free. Everyone is free on Wednesdays. Child-based discovery centers are another source of cool fun. For Sonomans wanting to get out of town, then the discovery center in Napa, Scientopia Learning Center, is a great option. Scientopia offers science, math and art based activities for little ones. Most importantly, Scientopia is also air conditioned. I hope you found some of these ideas helpful. Feel free to weigh in and mention your favorite summer activities in the comment section. In the meantime, good luck staying cool and be sure to check back for more ideas on staying cool during summertime. This entry was posted in Uncategorized and tagged children, cool, summer on July 27, 2011 by Modern Mama.